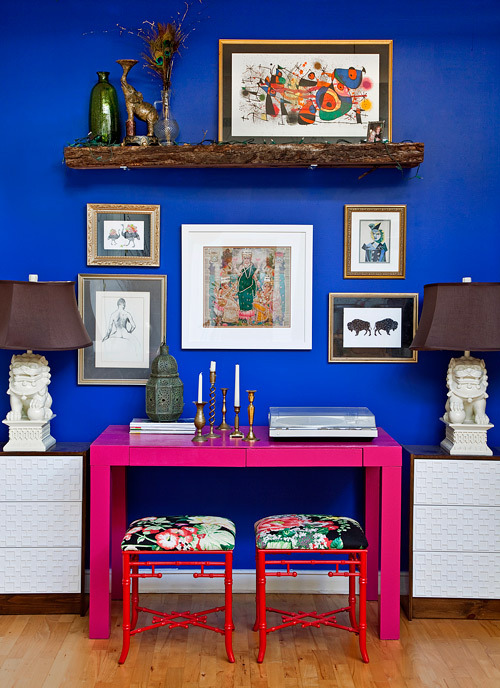 I had to re-post these images from Naomi Stein's loft via Design Sponge. These four photos are my favorite, but you must check out the entire space on Design Sponge. 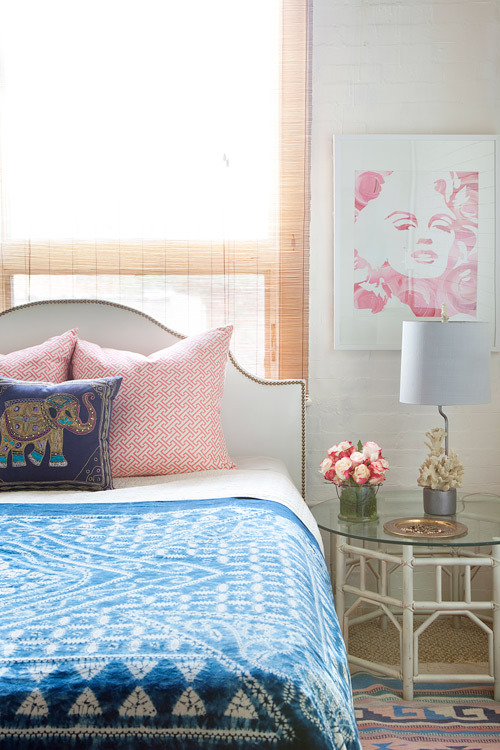 I love this bedroom because it reminds me of my little sister. Boho-chic, with a dash of prep, and a touch of class. The only thing that would have to be nixed is the Manroe picture. That wouldn't fly with the little one, but it's one of my favorite features of the room. Over-the-top glam, yes please. The print is actually called the "Marilyn Monroses" and you can buy it here in various sizes and forms. The small poster (unframed) just shot to the very top of my wish list...(psst Santa, do you read my blog?). I love how its framed in white, it keeps the look so soft. My other love in the bedroom is the headboard! Unfortunately, it was a steel for $60 at an Urban Outfitters sample sail. Fortunately, Target has the Monaco Nail Button Headboard which is spot-on and also on my wish list (can somebody in my family read this blog for goodness sake?). 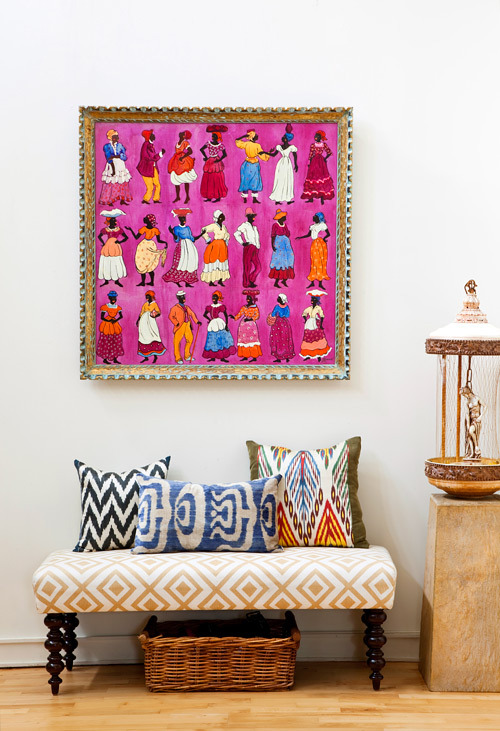 Of course, the killer pink pillows are non other than Caitlin Wilson of CWD Textiles (I have a small obsession with this fabric). 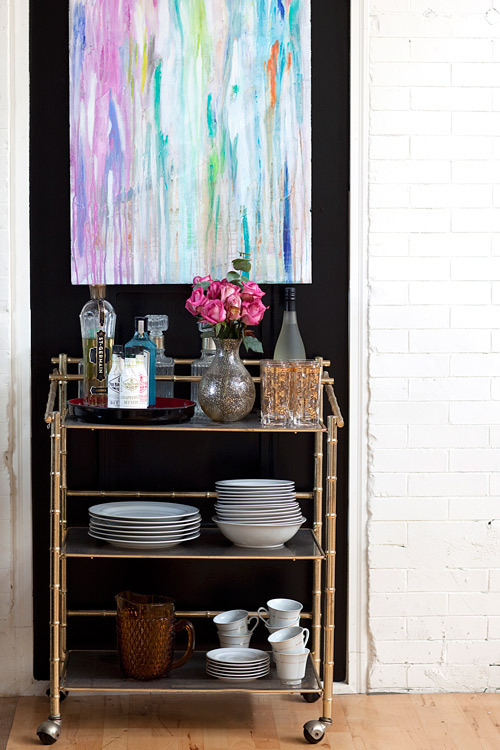 Note to self: Next home MUST HAVE a bar cart. I also love exposed brick that is painted white. Above, so BOLD. Love Naomi's ability to design outside of the box. Also, those little stools are a DIY project. For more images and sources head on over to the original post. Also check out Naomi's blog, Design Manifest. Saw this on Design Sponge and I agree - so many great features in each room. I especially love that the decor is eclectic and looks collected over time. so good! love her style. "ESSEX UPHOLSTERED BENCH, IKAT GRAY/FLAX"
Thanks so much for the kind comments and sharing my space. I really loved reading what you had to say about it. I really did get lucky with the white brick, didn't I? I hope you get Marilyn Monroses, because she is fabulous!